I guess we know it's summer because last night, it was too hot to sleep? And also because the rain and cool weather of May made getting the cooler going kind of a 'let's do that later, like in June' thing? Neither of us could sleep, so we turned on the light and read for awhile, till an hour that made the wake-up hour of 7:30 seem laughable. But arise we did, not laughing at all. More or less--the historian arose, and went to work, while I thought about things for awhile before I got up. Fine, I stayed in bed and slept for another hour. It's true--until today, we had not planted a thing in our garden. 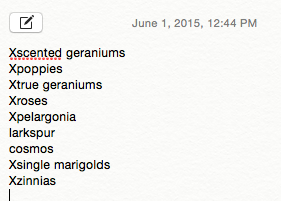 So I betook myself to the exemplary nursery of my town, Glover's, and bought mad amounts of scented geraniums, poppies, true geraniums, roses, pelargonia (which is what people usually think of as geraniums--you're welcome for this pedantic botanical note), single flowered marigolds, and zinnias. Also: two tomato plants and some lemon verbena and some flowering tobacco. Instead, I ate some salad and wrote some more on my draft-before-the-draft of my summer epic poem. And then I went and worked out. And then I made dinner like a champ. And then I took a brief nap and then, the people, THEN we planted our flowers. Pictures tomorrow. The garden looks swell, and its belatedness is quite chic, if I do say so myself. I love accounts of your days. Your days, I want to inhabit them myself. Awesome plan btw.